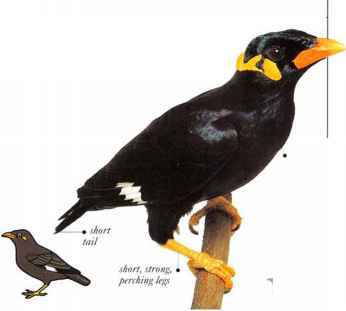 Known in captivity for its ability to mimic human speech, the Hill Myna also chatters constantly in the wild. Its calls are very varied and can be musical, harsh, or wheezy. The species occurs in tropical forests and plantations. It lives in the forest canopy, foraging for food in small parties; if it has to visit the ground it hops slowly and heavily. The birds feed mainly on fruit and berries, also gleaning insects, catching winged termites, and visiting flowering trees to sip nectar. • NEST a cup nest placed deep in a hole in a tall tree. • DISTRIBUTION Scattered areas in the Indian subcontinent, and from the Himalayas east into S. Ghina and much of S.E. Asia. 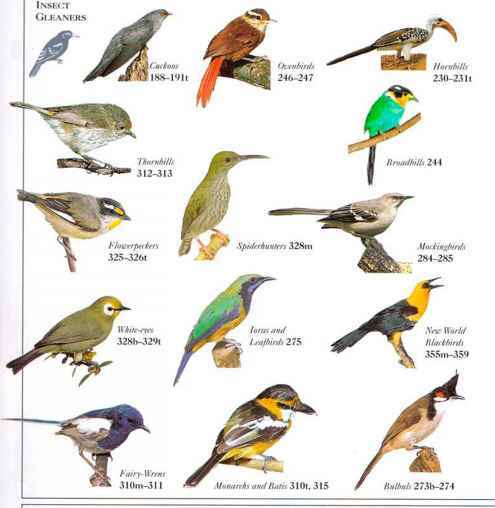 • REMARK Aviary-bred birds reared in isolation from their parents become-good mimics of human speech. I his grassland bird finds its food on the bodies of large-grazing mammals such as giraffes, rhinoceroses, zebras, and cattle. It clambers about with its sharp claws, using its tail as a JUVENILE prop, and removes ticks and other skin parasites with its bill, which is flattened sideways, with a blunt tip for dislodging the prey. The oxpeckcr also probes into skin wounds and sometimes feeds on wound tissue. 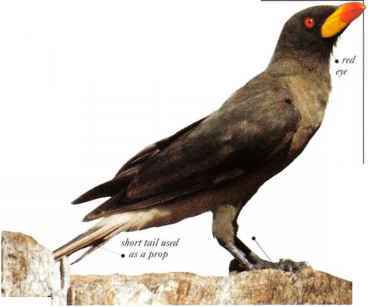 If alarmed, the bird dodges around the host's body to hide. Oxpeckers take the opportunity to drink when their host visits water. At night they roost in flocks in trees, in reedbeds, or among rocks. • NliST A pad of feathers, grass, and hair, placed in a natural hole in a tree.